Isn't this a beautiful promise? I admit there are moments in life when weariness, struggle and anxiety consume my thoughts and I choose to sink into a time of quiet solitude before turning to God. When this happens a season of unrest can last longer, gathering tumbleweeds of self-doubt and despondency, with nothing good coming from it all. Yet the many times I have turned to God first, seeking to lay my heart and woes at His feet, the tumbleweeds are quickly blown away and even though my trial may not disappear quickly I am stronger because HE is carrying me. He has drawn near to me and I am not alone. His Holy Spirit at work within me shines light in the darkness and speaks words of confidence and hope into my heart. Yes, even in the darkness He is there. You and I are never alone, never abandoned, never rejected...when we draw near to God. Father God in heaven, I praise You for your promise to never leave nor forsake us, to draw near to us when we draw near to You. This very day I pray for myself and every precious soul reading this, that we may run and not walk to You, that we will seek You above all else, that we will know the truth of Your promise and what it means to have You draw near to us. Fill us to overflowing with your goodness and mercy and grace, dispelling our doubts and fears. Lift us from the shadows which threaten our peace of mind and our joy, and shine the precious love of Jesus into our thoughts and hearts that we may be transformed to beauty from ashes and glorify You above all else. May we sing songs of praise to our Saviour as our eyes look above circumstance and rest on Your wonderful truths. Remove from the dark places in our minds the sorrows and mistakes of our past, and empty us of every negative attitude about who we are in Your eyes. Remind us that we are wonderfully made by Your plan and to Your delight and that everything You make is good. Forgive us of all our sins, wash them away by the blood of the Lamb and renew us from the inside out that little by little we may become more and more like Jesus. In Jesus most precious name. 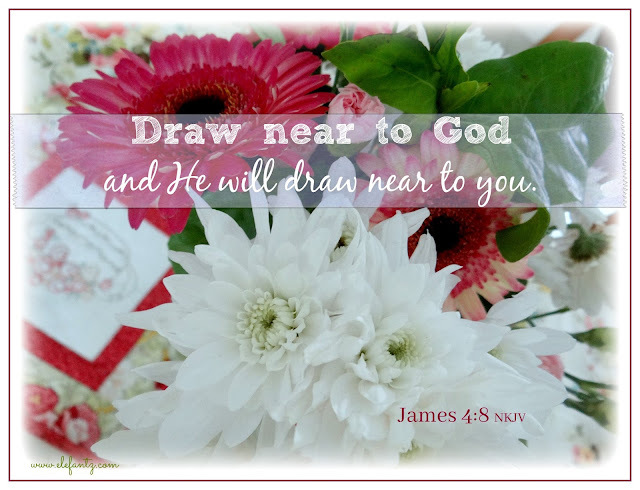 Dear friend, draw near to God and He will draw near to you. I just read this and oh, how I needed it! Thank you for your inspiring posts, Jenny! I always remember ... He loved me first. I try to stay near Him at all times. It's the only safe place. Thank you, Jenny, for another inspiring reminder and post. Thank you for the reminder. Always needed.